As this Aussie Adventure departs at 6.45am, accommodation will need to be pre-booked for the previous night. Take in the rolling hills and coast line of the Fleurieu Peninsula to Cape Jervis. Board the SeaLink ferry to Kangaroo Island. On arrival in Penneshaw meet your Driver Guide. At Rob’s Sheep Shearing witness a shearing demonstration by a real Aussie character. Next stop is Pennington Bay, a spectacular beach and a great photo opportunity. Continue to Emu Ridge Eucalyptus Distillery, the only commercial eucalyptus distillery in South Australia. 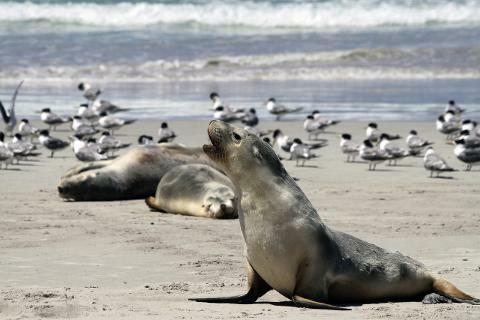 Visit Seal Bay to get up close to wild Australian sea lions who frolic on this stunning beach. At Little Sahara explore huge white sand dunes and test your skill at sandboarding. Arrive at Vivonne Bay Lodge and enjoy some free time before our BBQ dinner. There’s the option to kayak on the Harriet River, swim at Vivonne Bay Beach, or take a self-guided walk through property tracks or trail bike riding. After breakfast get up close to more wildlife at Hanson Bay Wildlife Sanctuary. Search for koalas nestled up in the eucalypts and see kangaroos grazing on the open fields. 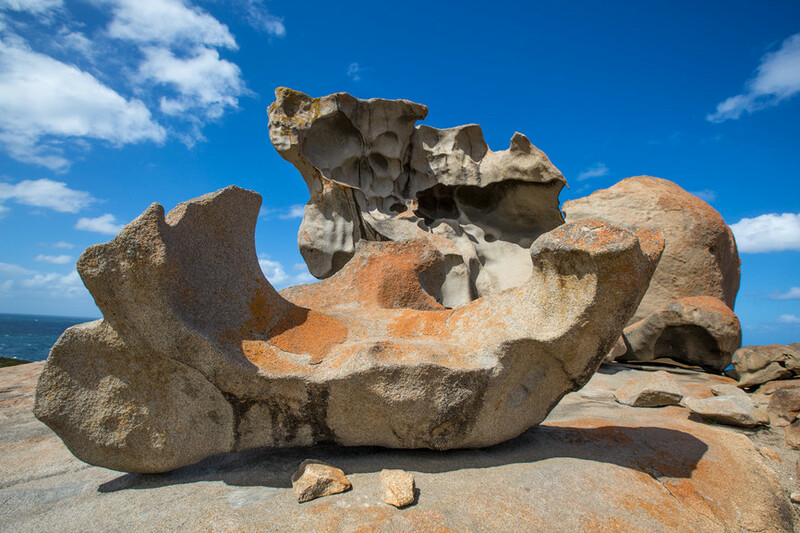 Continue onto Flinders Chase National Park where you will be amazed by Remarkable Rocks, huge granite boulders sculptured by nature. Visit Admirals Arch at Cape Du Couedic where you will see the resident New Zealand fur seals frolic in the ocean and sunbake on the rocks. Enjoy a delicious BBQ lunch at the Flinders Chase Visitor Centre. Head to the secluded ‘secret’ beach of Stokes Bay and take a walk at Ironstone Hill to find wallabies and admire the spectacular view back to the mainland. We head back to Penneshaw, allowing time to purchase dinner (own expense) before the return journey to Adelaide by Ferry and coach, where your Aussie adventure concludes. As this Aussie Adventure concludes after 10.40pm, accommodation will need to be pre-booked for tonight.